LaundryESP® has documented our industry’s capabilities in addressing evolving issues and priorities related to pollution prevention and resource conservation. The Facility Data Survey results reflect our success in protecting the environment and our respect for our customers’ and the public’s interest in green, sustainable business practices. The figures also demonstrate the efficiencies we have realized through technological advances. A popular measure of the “greening” of a business is its progress in reducing its carbon footprint or carbon dioxide emissions. All businesses emit carbon because they use electricity: the emissions occur at the facilities where their electricity is generated. LaundryESP® sums these with forms of in-laundry energy use at textile services facilities to determine the industry’s annual carbon footprint and expresses this as a total of pounds of carbon dioxide per pound of textiles processed. 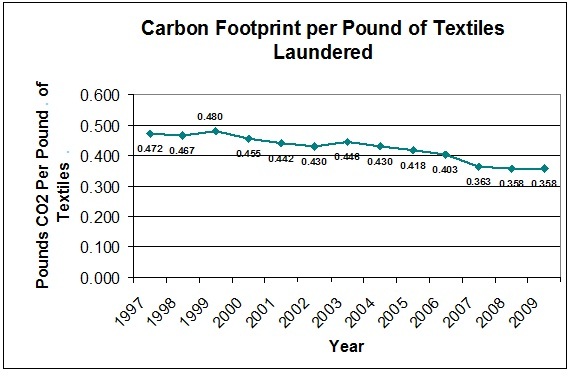 The accompanying graph shows this figure has declined by 24% over 13 years, from 0.47 pounds of CO2 per pound of textiles to 0.36 pounds. Textile services facilities conserve resources better than ever in part because of washing, drying, wrinkle removal and material handling technologies that enable us to do our job more efficiently. More businesses are choosing textile services facilities to handle their laundry work. Hotels’ and hospitals’ small washrooms are shut down in favor of shipping goods to larger facilities that offer greater economies. Restaurants opt for the benefits of larger scale cleaning for their table linen instead of neighborhood laundries. Other industries see the benefits of outsourcing the care and inventory of their work uniforms to our industry. LaundryESP® shows that we produce more laundry, which takes the strain off the environment from washing and drying taking place in smaller, less efficient machines. Greater energy efficiencies in laundry processes have been largely responsible for our decreased carbon footprint. LaundryESP® examines the industry’s progress with all forms of energy, calculating British thermal units expended per laundry pound for each individual type of energy and also for total energy (a total Btu basis across all fuels). The volume of water that textile services operations use to launder a pound of textiles is one of the strongest indicators of our green impact. When comparing this figure with the same one generated by smaller laundries, such as home machines and washrooms in hotels and hospitals, our conservation capabilities are revealed. We require less municipal water to launder and we experience greater associated efficiencies that serve the public interest, including less energy needed for heating and a larger discharge to sewers, which we filter and thereby enable sewage treatment to operate more effectively.